For your safety and comfort, sport shoes have to be worn and long hair has to be tied. Clothing with long sleeves are recommended. High wire activities involve wearing climbing harness, getting speed and momentum while surrounded by obstacles, and include the risk of an arrested fall. They are not indicated to people with back injuries or heart conditions, and to pregnant women. All children must be supervised by an adult aged 18 and over. Active supervision is essential. It can be managed from the ground, but an adult will be required to go up in the trees with the children when they can’t demonstrate their ability to manage the safety systems by themselves. Continuous belay system on all the circuits: participants are permanently connected to the lifelines with an engineered tether, from start to finish, until they are back on the ground. No clipping, no clicking, no complex connectors, the risk of being accidentally disconnected is simply eliminated. High wire challenges, like any outdoor adventure activity, involve a level of risk which can’t be reduced to zero. We manage hazards to ensure the risks are kept to a very minimal level, with minor consequences when incidents happen. Our safety systems are regularly and thoroughly reviewed for efficiency and compliance, and we strive to implement safety procedures in line with current best industry practice. Safety inspections are carried out by independent experts every year. The courses are checked every day by the staff before opening. Personal Protective Equipment and fall-arrest systems are checked before each use. Our staff is periodically trained and assessed against NZAPES standards, the New-Zealand Organisation of Adventure Parks Operators. 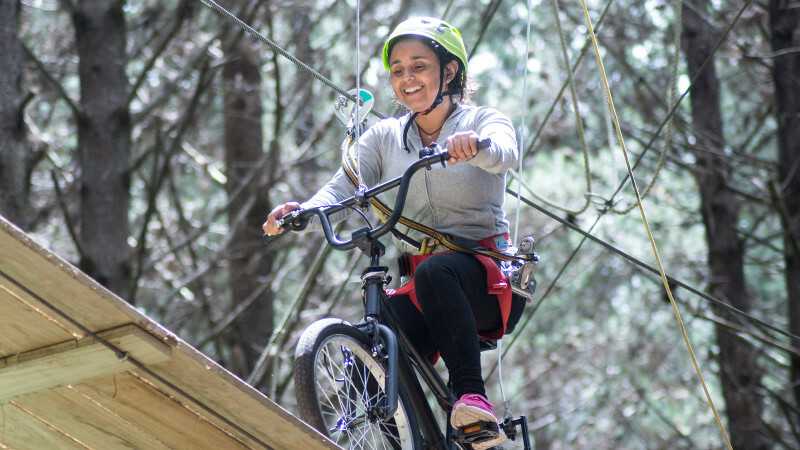 Adventure Forest is registered with WorkSafe NZ (MBIE) as required by the Health and Safety at Work (Adventure Activities) Regulations 2016 and has passed the mandatory external safety audits. Our risk assessment can be requested there. We operate with NO ACCIDENT since our opening in 2008.